You can transform almost any container into a candle vessel. Eggshells are the perfect vessle for a small votive style candle. Make these for any occasion, but why not try them around easter for a great spin on an Easter present. Step 1. Gently clean your eggshells in some soapy water and rinse. Step 2. Place a few drops of food dye into a bowl of vinegar. One bowl for each colour. Step 3. Place your eggshells in the dye bath and roll them through the dye for about 30 seconds. Keep the eggshell in the dye for longer if you want a stronger colour. You can use a spoon if you don’t want to colour your fingers. Step 4. Dry your coloured eggshells on some paper towel. Step 5. Place dried eggshells into an egg carton. Step 6. Cut a piece of wick to 10cm in length and thread it through your metal tab. Step 7. Secure the metal tab & wick to the bottom of the eggshell using a hot glue gun. Step 8. Tie the pieces of wick to a wooden skewer to keep the wick out of the wax. Step 9. Place your soy candle wax into a Pyrex jug (or a double boiler saucepan). Step 10. Place jug in boiling water on the stove and wait until it melts. It will become clear when it’s ready. Take it off the heat as soon as it has melted. Step 11. Pour the melted wax into the eggshells as carefully as possible. Step 12. 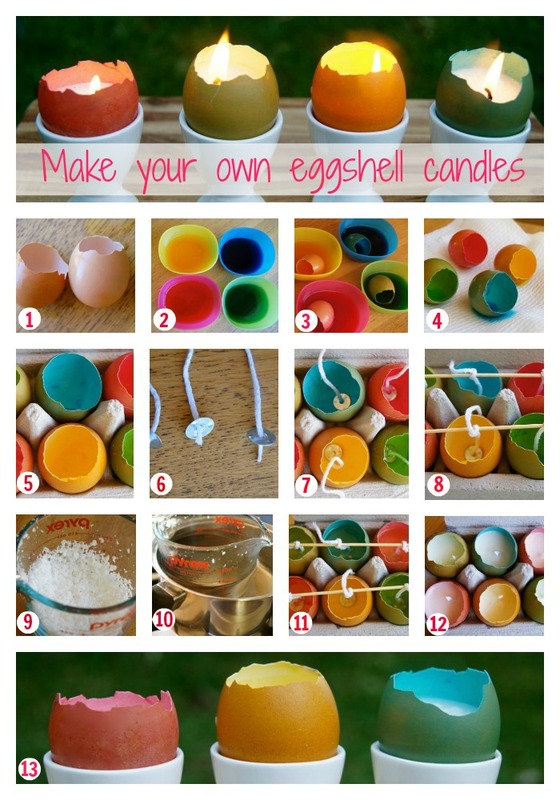 Leave your eggshells to dry for a few hours and once the wax is hard you can remove the wooden skewers and trim the wick. Step 13. Place your new candles in some ceramic eggcups or make your own candle holders. Actvity created by Frog Goose and Bear.